Looking at the Glen-L camper plans it looks like most are designed for a 'standard' pickup bed. My truck is actually a flat bed. I don't have a picture handy, but here is a link to the same basic truck (1 year newer, different color, but otherwise basically the same). 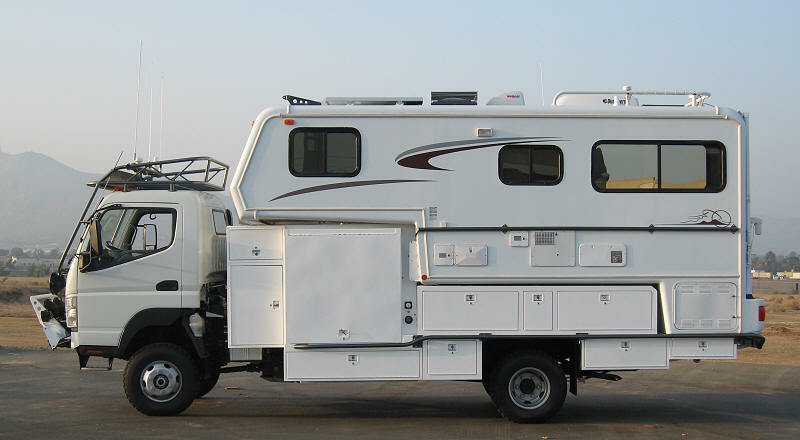 I don't know much about truck mounted campers, as I have only used camper trailers in the past. Any thoughts on adapting these plans to sit on a flatbed? 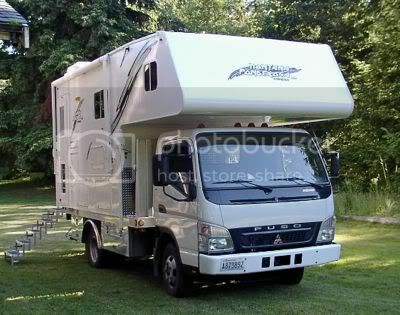 In general, how do the campers mount to the truck? 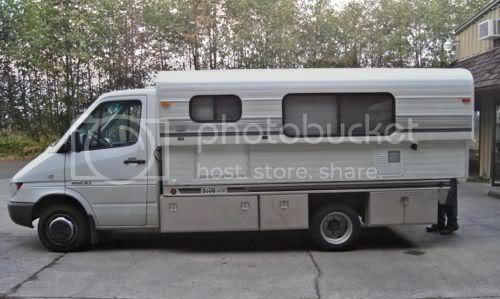 Would it be different for a flat-bed since you don't have the bed sides to help keep the camper in place? First, is your truck a 1 ton dually like the one in the photo? I ask because flatbeds are usually mounted higher than a regular PU bed. This means the center of grav is going to be higher and truck campers have a real tendency to cause the truck to sway all over the road. I've owned 2 truck campers and finally swore off of them when I sold the last one. They're always way too easy to overload the truck with them and they can be downright dangerous. But these things can be addressed by simply matching the camper to the truck and by keeping in mind the limitations of each. From a practical standpoint, they make a lot of sense because you can take your truck, your camper AND your boat if you want. You can park your rig anywhere you can park a PU truck. The down side is that gas mileage goes to hell in a handbasket because of the wind resistance. My last camper was a 10ft on a 3/4 ton Chevrolet that was set up just for these campers and even so, it always felt like it was going to tip over at any minute. It wasn't fun. Also, even with a 350 SB chevy, I couldn't squeeze out 60mph and I was getting around 2 miles to the gallon. So we only used it for weekend trips to the local lakes and usually figured on investing a full tank of gas to make the trip. Both of my campers originally had these cheezy little "j" hooks on the side of the bed but in a good cross wind, you could see the sheet metal distorting. So I ran good strong peices of square tubing under the trucks and fastened them to the trucks' frame with large U bolts. Then I would chain the campers to the square tubing cross peices. But then the swaying action of the camper caused the anchor points of each camper to start pulling out. If I were to build a camper, I'd give a lot of thought to making these anchor points VERY strong. But you've got a flatbed and things are a little different. If you're going to build specifically for the flatbed, you'll have to do some design changes and it'll be pretty much up to you how you figure it out. I don't think anyone here has really done that. One thing that I can quickly see though is that the clean out for the potty is going to interfere with the flatbed unless it hangs WAY off the back. Ordinarily, on a camper in a PU truck, the tailgate is taken off and the potty is located at the very back of the camper. That way, there is a place for the plumbing to hand down. On smaller campers that don't have overhangs, a simple porta-potty is used and you gotta take the little bags out and dispose of them. So you'll have to decide what to do. I hope this helps and if nothing else, maybe this will get the discussion rolling. My truck is indeed a 1-ton dually, like in the picture. It's a 1969 that I've just picked up and am doing a minor restoration (good once-over mechanically, fresh paint, etc). The flatbed is quite a bit higher than a standard pickup bed, which wouldn't be a problem for camping, but I hadn't considered the higher center of gravity when going down the road. That definitely sounds like a big problem! I've only pulled a coleman pop-up camper, so things like the higher center of gravity didn't even occur to me! As far as how the campers attach to the truck - do they basically just sit in the bed, and then are chained down to the truck? In your case, to the piece of square tubing bolted to the frame? Am I understanding that correctly? fb99999 wrote: As far as how the campers attach to the truck - do they basically just sit in the bed, and then are chained down to the truck? Yes. The 2nd camper I owned had some shock absorbers that went from the cabover to the cowling in front of the windshield on the truck itself. They did a good job taming the beast but no matter how you do it, the camper is going to wiggle in the truck bed going down the road. ...that is at least on a conventionally designed camper in a truck with a traditional PU bed. It was that wiggling that tore the mounts out of the campers themselves. When I had installed the cross peices of square tubing, nature took its course and the next weak link was exposed. However, neither of my campers was new. Quite the opposite, they were both old and they both had some water incursion probs. With all the epoxy technology and know how available, I see no reason why sturdy anchor points couldn't be built that will basically NEVER fail in normal use. But I would use good plywoods, hardwood framing, epoxy and make sure that everything is sealed up and won't ever leak. ...just like in boatbuilding. fb99999 wrote: In your case, to the piece of square tubing bolted to the frame? Am I understanding that correctly? Yes again. I had 2 lengths of square tubing about 6.5 ft long running crossways. I had 45 degree angles cut in them so that I could drill holes in the long point and mount some heavy duty eye bolts which I could then fasten the chains. One length of tubing ran crossways up toward the cab and the other section back near the tailgate. I had to figure a way to mount them to the truck's frame so that they would ride lower than the body work on the bed. So I cut and welded whatever it took to get it to rest against the frame rails on the truck when U-bolted up. I hope this makes sense. I got to thinking some and it occured to me that your flatbed may have stake pockets. It also might a number of fastening points for load binders of some sort or the other. You might just have to a little creative but you also might come up with a really super solution that works better than any PU camper ever thought of working. fb99999 wrote: The flatbed is quite a bit higher than a standard pickup bed, which wouldn't be a problem for camping, but I hadn't considered the higher center of gravity when going down the road. That definitely sounds like a big problem! I've only pulled a coleman pop-up camper, so things like the higher center of gravity didn't even occur to me! After my first post, I got to thinking about that and with the truck being a dually, it may not be all that critical. That's because all the camper designs that Glen-L offers are designed for half and 3/4 ton trucks. A 1 ton dually is MORE than sufficient. I've always said that anyone used to a half ton truck, is blown away when they step up to a 3/4 ton. Well, the amount of step up is even more between a 3/4 ton and a 1 ton dually. I know. I've always been amazed at how much more a 3/4 ton would do than a half. But the first 1-ton dually I ever got immediately got me to thinking how I ever lived with those puny 3/4 tons. LOL You've got a LOT of truck there for this application. So here's what I would do. Make sure you know the length of your flatbed and build your camper for about a 2 foot or so overhang off the back. That way you have that extra 2 feet or so for your potty facilities. Then I would build the base of the camper the full width of the flatbed because there would be no reason to make clearance for wheel wells. The dimensions of your flatbed would give you the dimensions of the camper's footprint and would determine how high the overhang on the front should be. This should all give a LOT more stability and I think we'd all be surprised. You could then use the Glen-L plans simply to determine how to plumb in the water, electrical and get ideas for cabinet and interior placements. If you decide to go this way, PLEASE keep us posted as to the progress because you gotta know that others have been wondering about these things too. I currently have 2 F-350 duallys for my lawn biz. I love both of them and they are hard working trucks. And they're both flatbeds. I personally would be very interested in having just such a camper for one of these trucks because they could easily do double duty if the camper were "right." Did you ever think about taking the flatbed off & just building the camper directly to the frame like the old chassis mount campers were? 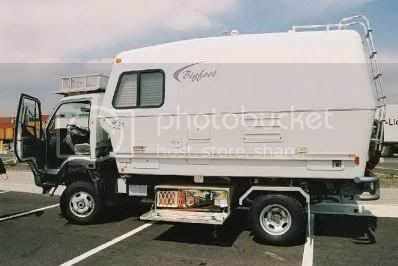 You'd loose the ability to take the camper off & use the flatbed,but it would lower center of gravity,make it easier to get up in the camper,& gain a lot of stability as well as negating the need for tie downs. I don't know what size your boat is, but did you ever think of pulling the boat and trailer up onto the truck so you can still tow a travel trailer? I am planning on doing that with my Crackerbox. I will build a body that looks like the old race car haulers that were put on 1 ton duel wheeler. but that doesn't let me take the boat. Mr. Grason has some good points r.e. the higher CG, but keep in mind that his experience is with trucks that have single rear wheels. Your duallie has a wider stance, which should help offset the instability he mentions. 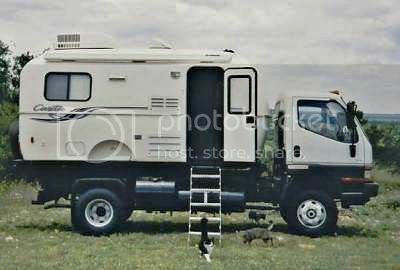 Also keep in mind that a standard camper, sitting on your flatbed, is going to have quite a gap between the top of your cab and bottom of the camper's over-cab section. If you can modify the plans to eliminate this gap that would help lower your CG. I also want to echo upspirate: If you don't need the flatbed for other purposes, take it off and get a set of the 'Wildwood' plans. In '72 my father built a chassis-mount motor home based on a set of Cascade plans (the motor home plans weren't available back then) and it's still on the road. So modifying the plans is possible, depending on your skill set! Actually, if you are going to keep the flatbed, you might also consider getting a set of plans for a pull-behind (or 5th wheel) trailer of the right length. That way you won't have to deal with the cut-out areas along the sides of a slide-in camper. Looks like the shortest trailer that Glen-L offers is 16', though. Dave Grason wrote: I went to the Hackney website and perused all over it. Wow, what a concept! While I was there I saw the link to "truck transformers" and I took a look at that site as well. This just might be the best compromise for what this thread is talking about - an adapter type affair that allows the installation and removal of all sorts of different bodies for trucks. And there are a couple others around. The complaints that I've heard about the TruckTransformer type is that they add a lot of weight. Also, (if you care about such things) the standard pickup bed will fit about 4" higher when installed, making it look funny. If you're interested in off-road campers there used to be quite a lot of info on www.expeditioncampers.com, which is slowly being migrated to www.expeditionportal.com. The camper builders on that forum persue well-thought-out designs using high-quality (usually marine) components. Having a pop-up would solve the CG issues. You might be able to find an old Hi-Lo trailer and renovate it, but I don't know if they had a model short enough for your flatbed. yeah, did you read Hachneys bio...pretty impressive too. A revolution in truck camper design coming in 2008! They start off by describing what they don't use in the construction of the camper. Take a look at the 5th bullet down. "No PROPANE?" AW MAN! I've been really looking everywhere for a camper made of propane.